India, the country where the majority of population is price-conscious and seeks for budgeted and value for money products, bound two-wheeler manufacturers to built motorcycles with requisites and fit in their budgets. A number of top-ranked automakers in the country provide the best return on investment bikes to choose from. Here in this post, we listed down the top five value-for-the-money bikes in segments ranging from 125cc to 400cc. Check them out. 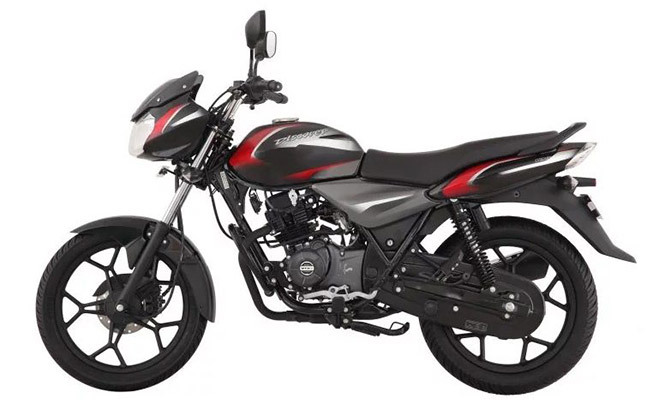 Bajaj Discover 125 is a 125cc commuter motorcycle which is priced under INR 60,000 (ex-showroom). Such an economical price tag could easily mistaken anyone for a 110cc motorcycle. In the market, the Discover 125 is available in two choices of drum and disc. Under the fuel tank, the motorcycle is packed with a 124.6cc engine that is capable of churning out the peak power of 11PS along with 10.8Nm of torque. The premium features like LED daytime running lamps (DRL) and alloy wheels are standard bits while front disc brakes are being offered as an optional extra. 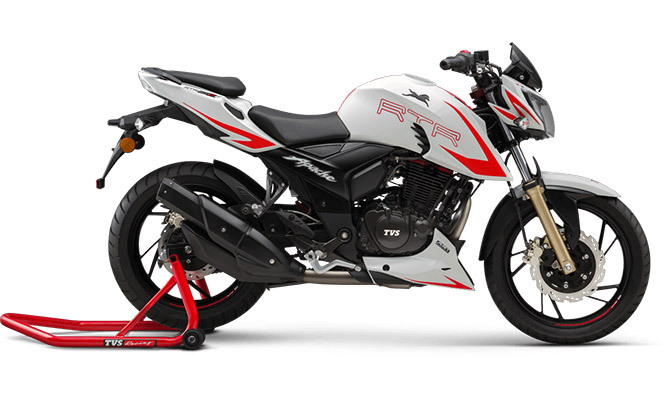 The TVS Apache RTR 160 4V is the lowest variant in Chennai based bike maker’s Apache RTR range of motorcycles. Aggressive in styling, the RTR 160 wears sharp design along with a plenty of features which makes it ranked top in the segment. One can choose two of its variant- Carb and Fi available in the market. It is powered by a 159.7cc engine. With carburettor setup, the engine is capable of generating 16.5PS that is slightly lesser than the fuel injected variant at 16.8PS. While the torque generation for both the variants is identical at 14.8Nm. The presence of ram-air assist sports in reducing engine heat by 10 degree Celsius. Onboard features on the bike include a snake fang-like LED DRLs, an all-digital instrument console which conveys information like a lap timer, 0-60 timer and top speed recorder. In addition to this, the bike is equipped with an engine cowl and a double barrel silencer that adds to its sporty appearance. The suspension setup on the RTR 160 comprises a race-tuned rear monoshock developed in association with the Showa suspension. Already adjusted for compression and rebound damping, the monoshock offers an overall riding dynamics. Other than this, there is a pair of Pirelli tyres on offer as an optional extra which offers an extra grip while cornering. 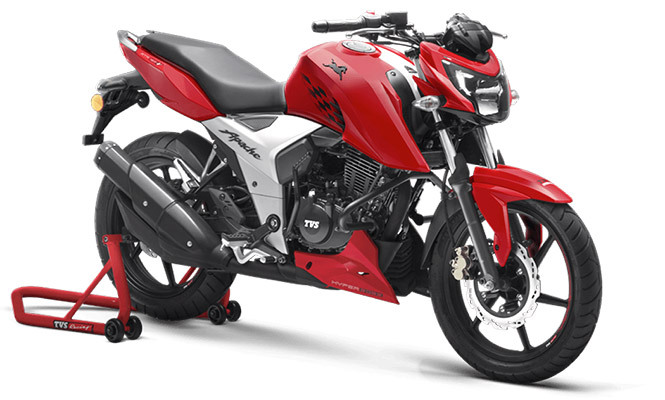 Packed with such top-end features, the Apache RTR 160 4V is an excellent choice in this segment. In TVS Apache range of motorcycles, the RTR 200 4V is a range-topping motorcycle. It is an outcome of TVS’ racing experience of 35 years which offers an enjoyable ride than other motorcycles in the respective segment. In a recent update this year, the Apache RTR 200 4V Race Edition 2.0 gets the cutting edge technological feature of A-RT Slipper Clutch. It reduces clutch lever effort by 22 per cent and prevents wheel hops during hard downshifts. Also, the placement of higher foot pegs allows clean cornering. At the same time, the dual-channel ABS, which is being offered first in segment boosts rider’s confidence. 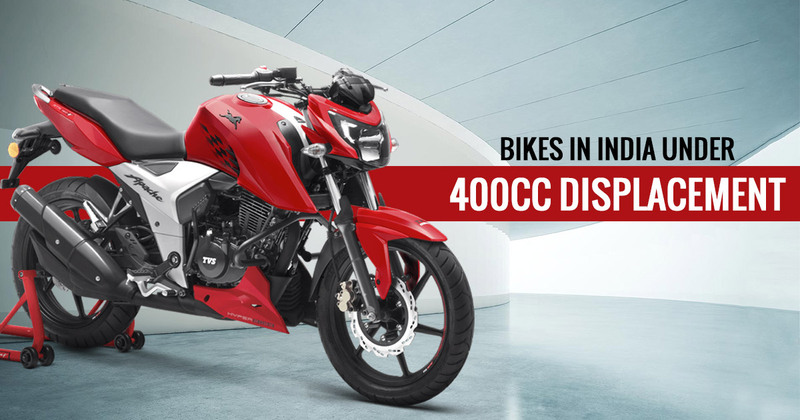 Powered by a 197.7cc engine with a ram-air assist, the Apache RTR 200 4V is on sale in India in two versions- the carburetted and fuel-injected. With the carbureted fuel system, the engine churns out 20.5PS, and 21PS with the fuel-injection setup. While the torque generation is similar for both the variants at 18Nm via a mated 5-speed gearbox. As the company claims, the shared suspension from KYB has been adjusted to provide track-focused performance. The Remora tyres are standard while the Pirelli tyres which offer a firm grip on the road are an optional extra. The Dual-channel ABS is stocked as standard on the RTR 200 4V ABS R 2.0 variant only. 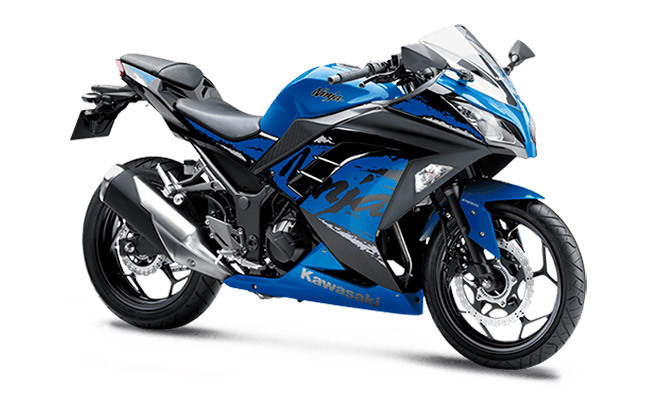 Kawasaki Ninja 300 is a supersport motorcycle from Japanese bike maker. Tagged with the price tag under 3 lakhs, the Ninja 300 is the most affordable twin-cylinder motorcycle available in the Indian market. Earlier, the bike was on sale at the price tag of INR 3.6 lakh (ex-showroom). However, a massive price cut of INR 62,000 in a bid of heavy localization of parts (body panels, wheels and tyres) bring down the Ninja 300 pricing to these affordable figures. The major underpinnings as the chassis and engine are being imported from Thailand as earlier. The 296cc, liquid cooled, parallel-twin engine generates 39PS of power at 11,000rpm and delivers 27 Nm of torque at 10,000rpm to rear wheel via a mated 6-speed gearbox. Its association with a slip-and-assist clutch makes a seamless transmission. Also, the Fuel-tank capacity of 17 litres ends up the need of frequent fueling on the move. The IRC tyres from the last generation model have been substituted via the MRF Zappers of measuring 110/70front and 140/70 rear. While the Dual-channel ABS is a standard fitment. The KTM 390 Duke is a power-packed motorcycle available at the price tag of INR INR 2.42 lakh (ex-showroom Delhi). Packed with a number of premium features, the second-gen 390 Duke is a value-for-money proposition. In an all-new design, the motorcycle comes featured with attributes such as all-LED headlamp and tail lamp, colour TFT LCD instrument console with smartphone connectivity, a side mounted exhaust setup and ride-by-wire aids for sharper throttle response as well. 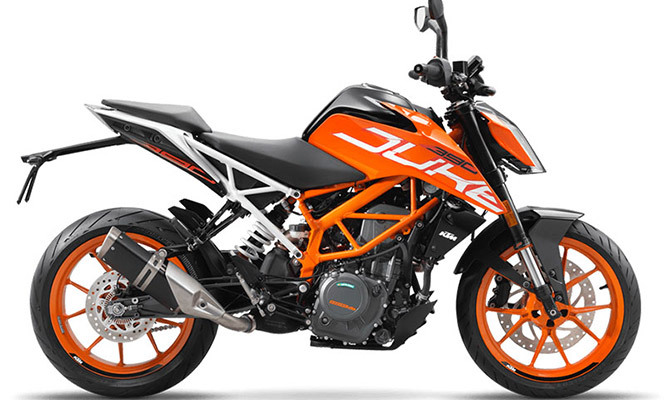 The 390 Duke gets power from a BSIV-compliant 379.2cc, single-cylinder, liquid cooled motor. It comes mated to a 6-speed gearbox transmission with a slipper clutch to send the generated power of 43.5PS at 9000rpm and 37Nm of peak torque at 7000rpm to the rear wheel. The fuel tank on the KTM 390 Duke is slightly bigger at 13.4 litres than its younger siblings in Indian lineup. Additionally, the KTM Duke 390 is equipped with a cartridge type suspension which has compression on one side and rebound on the other. This mechanism makes the bike more compliant at low speeds. Also offers sporty handling at the same time, for which the Duke is renowned all over. If not satisfied with that much, the ABS unit on the 390 Duke is 3-stage Bosch ABS unit with On, Off and wait for it accessibility. With the Supermoto mode, one can switch off ABS at the rear and lets the bike slide.